That’s it – summer is officially over. We have had a great summer in Berlin with plenty of sunshine and warm evenings to enjoy an aperol spritz on the balcony or sitting in a beer garden. But we shouldn’t be all doom and gloom about the end of summer. Autumn is one of my favourite seasons and you can already see the fresh autumnal produce creeping into the supermarkets. Pumpkins, apples and root veg – I am already planning on making my next batch of chutney! I was in my local supermarket the other day and spotted the first batch of this seasons mussels. 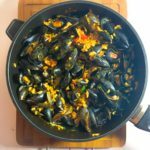 Mussels thrive during the colder months so they only get better as the months get colder but I am always quick to snap them up as soon as possible! 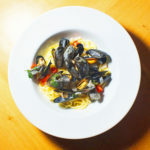 One of my favourite recipes is mussel linguine cooked in a rich and creamy broth but last weekend I wanted to try something a little different. 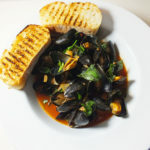 While I always add a bit of spice to to my mussels I wanted something with that little extra kick. 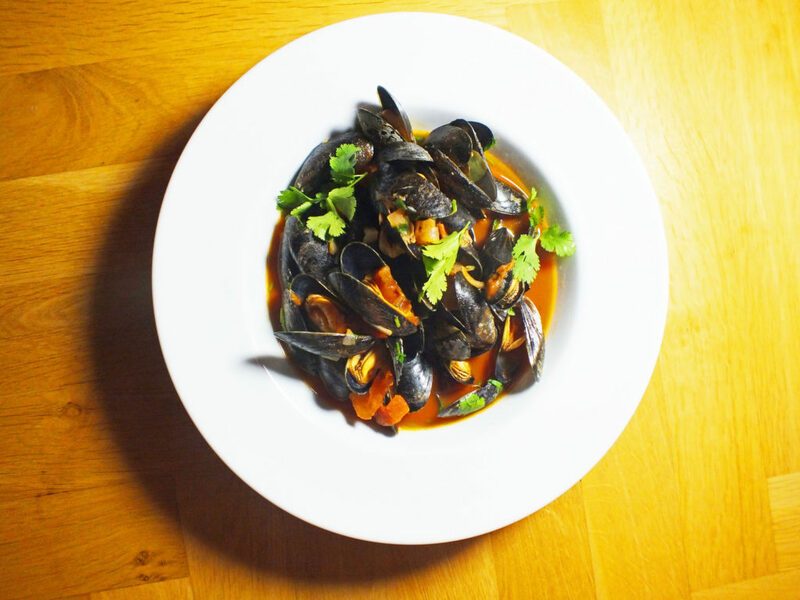 The tomato broth is cooked with smoked paprika, fresh chillies and harissa paste. 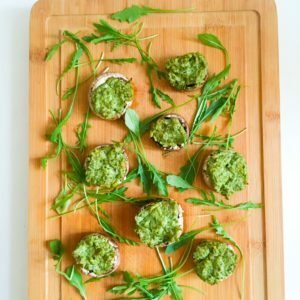 The coriander gives it plenty of fresh flavour. Make sure to serve some garlic bread on the side to soak up all the juices! In a large pan add a dash of olive oil. Once hot add the shallots and a pinch of salt. Cook on a gentle heat for about 5 minutes until the onions are soft. Add the tomatoes and chilli. Stir in the garlic and then mix in the paprika and harissa paste. Leave to cook for another 5 minutes. Add the passata, white wine and hot water. Bring everything to a gentle boil and then add the mussels. Give everything a good stir and then place the lid on the pan. Leave to boil for around 7-10 mins. Once the shells have opened take the pan off the heat. 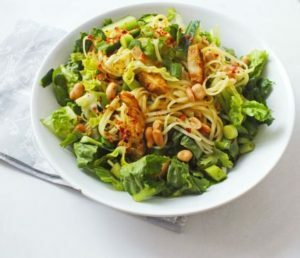 Add the coriander and lemon juice. Season with a bit of salt and black pepper and give everything another good mix. Plate up and garnish with some extra coriander.